Around early 1985, when I was working with Dubai based English Language Daily Khaleej Times, there were speculations of Dubai government planning to start an international airline. Many dismissed it as wishful thinking. However some said it could be made a success story. I asked Mr. Maurice Flanagan, then Manager of Dubai National Air Travel Agency, who later became the founder and General Manager of Emirates Airline. He confirmed and on 25 March 1985 Emirates Airline was launched with its inaugural flights to Lahore with Pakistan International Airlines providing two of the airline’s first aircraft on wet-lease. With $10 million in start-up capital it was required to operate independently of government subsidy. Pakistan International Airlines provided training facilities to Emirates’ cabin crew at its academy. Today this is the largest airline in the Middle East, operating over 3,600 flights per week from its hub at Dubai International Airport, to more than 140 cities in 81 countries. From March 2016 to February 2017 Emirates had the longest non-stop commercial flight from Dubai to Auckland. Emirates operates a mixed fleet of Airbus and Boeing wide-body aircraft and is one of the few airlines to operate an all-wide-body aircraft fleet (while excluding Emirates Executive). As of November 2017, Emirates is the largest Airbus A380 operator with 103 aircraft in service and a further 42 on order. Since its introduction, the Airbus A380 has become an integral part of the Emirates fleet, especially on long-haul high-traffic routes. Emirates is also the world’s largest Boeing 777 operator with 151 aircraft in service. When emirates airlines was launched, Sri Lankan airline, then Air lanka, has made remarkable headway as one of the most successful third world airlines .Air Lanka was established as the flag carrier of Sri Lanka once the Sri Lankan government shut down the bankrupt Air Ceylon. In 1998, the then administration of former President Chandrika Kumaratunga had sold 40 percent of the equity of SriLankan worth US $ 70 million, later increased to 43.6%, and give management to Emirates after it suffered years of losses. However Emirates exited the airline after 2008 sold their shares to the government. SriLankan Airlines, which made profit of 4.4 billion rupees in 2008, the year in which the management agreement with Emirates Airlines ended, has lost 107 billion rupees since then. Highlighting the precarious situation of Sri Lankan airlines, Deputy Minister Eran Wickremasinghe said on 24 March 2016, that colossal losses that state-run SriLankan Airlines was made to suffer since ex-President Mahinda Rajapaksa chased away Emirates Airlines, and a questionable aircraft deal, is a national financial crime. The Rajapaksa administration had cancelled the visa of then Chief Executive Peter Hill because he did not bump enough paying passengers to accommodate a large entourage of former President Mahinda Rajapaksa in a single aircraft, he said. By 2015 accumulated losses of 128 billion rupees, debt of 76 billion rupees (542 million dollars) and a hole in its balance sheet of 74 billion rupees. The hole in the balance sheet would have been bigger if not for capital injections by the Treasury from taxes collected from the people. SriLankan Airlines had been given 100 million dollars each year to cover losses by the Treasury. SriLankan’s management had then decided to buy A330 and A350 aircraft in a reckless manner, he charged. “Aviation experts have told us that the lease contract terms are 25 percent more expensive than normal and it needs to be looked into. “The present value of the lease liability over the next 12 years is 1.5 billion US dollars. According to local media SriLankan Airlines faces closure if tangible and sustainable restructuring cannot be achieved. Meanwhile, according to Daily Mirror of Friday 7 September 2018, Minister Champika Ranawaka disclosed that SriLankan had recorded a profit of Rs 80 billion when it was taken over by the government from the Emirates Airlines. Then after, the government established Mihin Air as a regional air service to Sri Lanka, Today the two airlines, have amassed a loss of Rs 200 billion and became liability to the Treasury. Each and every Sri Lankan pays Rs 10,000 per year to cover the cost of the two airlines which has become a curse to the country”. Now the question is who is responsible for this disaster. It is worthy to recall that Sri Lanka was an almost developed third world country during its independence in 1948 with political and economic stability, high level of free education, free health services and communal harmony. It was the time when Dubai was unknown and unheard of. Population was only few thousands and suffered from extreme poverty and illiteracy. There was no school, hospital, electricity or drinking water. Turning to stormy seas for fishing and trade remained their only means of survival. When the opportunity for development came in the wake of oil wealth they, rulers and the people, alike grabbed it with both hands and made this desert strip a most modern city state. Emirates hired people from all over the world irrespective of religion, language, culture or nationality. Those who performed well and contributed to the growth of the airline was promoted while others were sent home. The island’s successive governments, both United National Party and Sri Lankan Freedom Party, which ruled and still rule this country are fully responsible for this mismanagement. For example SriLankan Airlines has been accused in the recent past of corruption, and the former Chairman Nishantha Wickramasinghe of having affairs with air hostesses. Wickramasinghe, has been accused of lacking the experience or formal education that would qualify him to be the head of an airline. 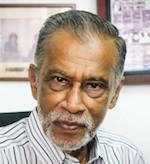 In October 2015, the Presidential Commission of Inquiry to Investigate and Inquire into Serious Acts of Fraud, Corruption and Abuse of Power, State Resources and Privileges (PRECIFAC) attempted to summon Wickramasinghe to inquire about various irregularities in the Airline; however, they were unable to locate him, and his wife claimed he had not come home for three years and that she was unaware of his whereabouts. Later he notified the PRECIFAC that he was abroad and was unable. This is the ridiculous state of affairs in the country where politicians protect each other. This happens more than three and half years after the present government was voted to power. It’s a simple logics .. It was under MR & co the majority of lost occurred .. Yet; people wants him back. Is it fault MR or people .. If people could bear the lost? It is not a the problems of MR ..
Because people still people.MR did not do any wrong thing but it was his families and friends.. So; can we believe him this time that he would not make any mistake..
Everything is Sri Lanka was used like the Rajapaksa’s family fortune. Sri lanka is paying for the Rajapaksa’s stupid arrogance. Peter Hill should be laughing his A** off. Mr Pirahaparan bombed the whole Srilankan Fleet.and destroyed every plane….. I am not sure whether it was when SLA was run by Emirates. Our inhabitants must be thankful that they have a Airline still, to call theirs, although most of them and even their children would never get a chance to sit in one on a long Trip. And it goes for the great majority of the inhabitant population of 70 percent in Lankawe. No International Airline in the World run at a profit except Emirates. Emirates never divulge how much they pay for Fuel. Emirates orders more new Planes than anyone else including the countries where they make those Planes. Again where the money comes from is not in their Financial Statements. In doesn’t bother me . I like to travel in Emirates, where Planes are New, Comfortable and the Service is A1. 33% of the last Financial loss of Srilankan is because of the cancellation fees on A350. The common knowledge is that the people who organized the Cancellation collected very very handsome Santhosam. And I believe it ,because A350 is a well sought after plane which is 25 % more Fuel Efficient than any other Plane in the market. And there are out standing orders for them. The fact that a Plane can fly for 16 Hours does not mean that you have to do that in one hit. Srilankan has about 6 Long Range A330s which were leased after the cancellation of the A 350. That is extra Santhosams for the dudes who signed the new leases . This Yahapalana Govt came with a bang to fix all Corruption. And Jail the Rogues and make everything Squeaky Clean. YES SIR! People and countries which started much later than Sri Lanka has done well, leave alone the Airlines. In 1975, at the conclusion of the Vietnam War, the country was in shambles. Today, it is a giant of its own. So many examples can be given whether in terms of organisations or as country as a whole. The reason can be summed up in one word as “Mismanagement”. When can we get over this illness. Lanka was (and is) ruled by lawyers, whose IQ levels have not been challenged by any living thing on heaven or earth. Dubai was a waste land run by pirates and small businessmen. See what difference true leaders can make !!! Yes, Emirates management did report a profit of Rs 4 billion in March 2008, in the Annual Report. You will also note in the same Annual Report an income of Rs 5 billion from the sale of 5 Airbus A340 aircraft (they were sold and taken back on lease) Besides a couple of engines. The loss from airline operations was Rs 1 billion. This government and its worthy ministers can not or refuse to understand difference between profit/loss from airline operations and profits declared by sale of assets. Minister Champika Ranawaka disclosed that SriLankan had recorded a profit of Rs 80 billion??? Learn to get you facts right before writing junk on behalf of the UNP. Minister Champika did not say 80 billion he said 8 billion but even that was proved wrong my another critic of SriLankan Airlines. It seem like now everyone is an expert at analyzing the airline. Leave it to the experts without making a fool out of yourself. “The island’s successive governments, both United National Party and Sri Lankan Freedom Party, which ruled and still rule this country are fully responsible for this mismanagement”. A national airline is a pride of any country. Sri Lankan with corruption right across the airline and Politicians adding to the woes is an absolute disgrace. Who can resurrect this airline is the billion dollar question. Mr Eran Wickramatne is conveniently passing the ball to others when his own PM totally mishandled the airline during the last three years by employing a CEO (Capt Ratwatte) who did not contribute a single cent to the airline . The airbus deal the cancellation of the PIA agreement , his monthly salary of Rs 5 millions plus other perks is a massive cost to the airline. Then Chairman Ajith Dias is another destructor who virtually a dead man doing nothing. While the rest of the board members, and employees are directly against these two people Ranil never wanted to take any action against these two for the reasons known to the whole country now. A presidential commission should be appointed to look in to the affairs of Ranil CEO Ratwatte and Ajith Dias. As the writer has correctly pointed out we should be ashamed of our position today having a good look at Emirates Airlines. Our miserable plight is so sad thanks to these KALAKANNI politicians of yesterday and today . An air hostess was released from the airline to work at the Presidential Secretariat and she was engaged in MP Namal Rajapaksa’s political work. She continued to be paid by the airline and was even paid the cabin crew allowance. It was found that she has been over-paid Rs. 24.2 million. Most people wonder if it was only Political work or some other………..
75 million was spent by the Srilanka Airlines on sponsoring Carlton Rugby 7s between 2009 and 2014 which included the issue of 600 free air tickets. SLA also spent Rs. 25 million on the Colombo night races in 2012-2013 which included the provision of 119 free air tickets. The people are not educated enough to understand whats going on and what the country needs is a very strong sincere leader to take over power and wipe out corrupt Politicians and its Leaders by the gun. The best person who should be elected in the next election should be Navin Dissanayaka or Sajith Premadasa or anyone from JVP. Its always better to elect a Young New Leader below the age of 55 years. Sira, Mara, Gota, RW, Basil, Dinesh, Chamal, Welgama are all oldies and expired. From the very beginning with Rakita Wickremanyake as its head, the carrier had a bad reputation. Rakita who they said was a relative of JRJ, was notorious for his sexual abuse of hostesses, even most pilots were allegedly upto mischief, but nowadays it is the norm in the airline & health care sectors. Once upon a time there was a mad rush among youth to join UL, but today even among frequent flyers UL is not a preferred choice to the extent neither My3 nor RW are using it on their foreign trips. Almost all the Middle Eastern airlines operating to & from CMB are reliable, safe & decent. Too many jokers talking about UL as if they know what they are talking about. For the best analytical explanations go through the FB page of Sanjana Fernando, a former Investment Banker from London. He has even challenged Eran for a debate on the airline. Few words about Maurice Flanagan (Later Sir Maurice) who guided Emirate Airlines to great heights. Maurice read French and history towards BA degree at Liverpool University. After a stint with RAF he joined BOAC (now British Airways (BA)) subsequently working for BA in Kenya, SRI LANKA, Peru, Iran, India and the UK. They say that those who come to work in SL fall in love with the place. When Air Lanka was in trouble Maurice stepped in (where angels fear to tread), and took over the management of Sri Lankan Airlines, probably because of the soft corner he had for SL. The culture of corruption/nepotism/impunity was on the rise. The last straw for Emirates was when the CEO Peter Hill’s visa was cancelled. Rest is history. By the way, Sir Maurice occupied the same house he occupied as the newly arrived Mr Maurice Flanagan. Young Maurice was a world class soccer player and middle aged Maurice wrote TV dramas. Dubai recognised the mature Maurice’s talent and gave him a free hand. Has SriLankan Airlines failed? There is a chance of recovery if the PCoI is not scuttled and firm action taken against wrong doers. My contention is there is no point in blaming MR for this .. It was a mismanagement of air line from top..
Eeelam people do not like him..
To Lankan: I think that Ealam nutters don’t like MR is because he gave them and their LTTE terrorists a humiliating defeat in May 2009. Their leader was left in a pool of mud, with eyes wide open and dead. Sad story for the Ealam nutters! I hope you understand now and agree I have answered your question. Oh please, it was VP who gave Mahinda the election and subsequently the victory with a lot of support from Hindia and USA. In fact the war criminals Mahinda and his brother Gota are eternally grateful to VP for the life they enjoyed and the wealth they accumulated from 2005 to 2015, and the impunity with which they are being protected even under UNP/SLFP government. The great work of Eran and the UNP gang. Now this is a financial crime. SriLankan Airlines paid LKR18.8 billion rupees (USD116 million) for cancelling an order for four A350-900s between 2015 and 2017, Head of Financial Management Yasantha Dissanayake told a Sri Lankan Presidential Commission of Inquiry. The sum includes forfeited deposits and penalties for cancellation. The Island reported that the flag carrier took out two loans with domestic banks to cover the penalty, including a USD32.5 million loan from Bank of Ceylon and uSD35 million loan from Peoples Bank. SriLankan has not yet repaid either of the credit facilities. During MRs time everything is possible, a Wharf clerk elected to run a airline, a brother-in-law elected to run our National Airline, relations to Ambassaders who had no clue of Dipolomacy etc etc. No wander they call this a Land of no other? Guys, no offense please, but truth has to be told – Not just Sri Lankan airlines, everywhere the Sri Lanka’s failure is Sinhalese mentality with few exceptions of course. There is no point in blaming MR or political parties that merely make use of this unique mentality not found anywhere in the world. What is wrong with sinhalese mentality????? You all are thriving in SL cos of sinhalese tolerance. That alone making us now 2nd class citizens in our own country. Get lost! Sandy, now that is a proof of what I have said. It is Wrong Mr. Farook saying Sri lanka Air line si smoney losing. How about there are real jobs in the management which pays lucratice salaries. So, Ranil have to give employment to those who supported him. There are 7000 card carrying members as employees for the 24 aircraffts (some had not been taken out of the hanger for the last few years). They get paid. Is that wrong. I heard a stewardess’s salary is about RS 500,000 and pilots say Rs One million Salary is something difficult to live with as they fly every where. Besides, that This Management had to pay the Salaries of some of the previous management members (RAjapakse govt) as that becomes corruption they pay it through a thrid party company.IF there is real investigation, probably bond scam profits wwere also transported by Sri lankan air lines. Airline business is highly competitive and business rivals resort to shady transactions like underhand rebates. Such practices cannot be carried out by a government owned Airline although it could be done by a private entrepreneur owned Airline. Government officials are good Managers but they are not inclined to be risk-takers because they are conscientious officials unwilling to take risks with unknown benefits. As a former Airline GM I know the underhand practices in the Airline business like rebating . The profits that can be made from competitive Airline business are not worth the undue risks. So let the government get out of this field without wasting public funds. It is not the lack of competence but the risk averse nature of our conscientious officials ( a commendable quality to look after public funds but not suitable in a business like airline business which is more akin to gambling ). It is like the government entering a gambling business – scope for profits is there but the risks are too high even for normal private sector. Such a business requires the mentality of the inveterate gambler. But should public money be exposed to such gambling risks even if there are profits to be made . Please take public funds out of the airline business. Sri Lanka was (and is) run by lawyers. No living thing can shine brighter than them, of course. Dubai was led by small scale businessmen. They knew the value of exptriate professionals. It is no rocket science to understand why government managed enterprises are often mismanaged and Sri Lankan Airlines is a typical example. It has been 40 years since this prestigious company was inaugurated and yet there is no sign of prosperity at sight. During the last forty years of existence, one should imagine the colossus amount that would have drained which is a black hole. Covering this huge blunder with racial abuses won’t take us anywhere. Million dollar question is do we really need the folly pride of owning an airline busting people’s money running into many billions while the poor people are struggling for three times meals a day. Has anyone else read this article on sriLankan airlines and its financial crimes?